And stripping him, they put a scarlet cloak about him. And platting a crown of thorns, they put it upon his head, and a reed in his right hand. And bowing the knee before him, they mocked him, saying: Hail...! The cowardly Roman governor imagines that the hatred of the [crowd] will be satisfied by the sight of Christ in this pitiful state. 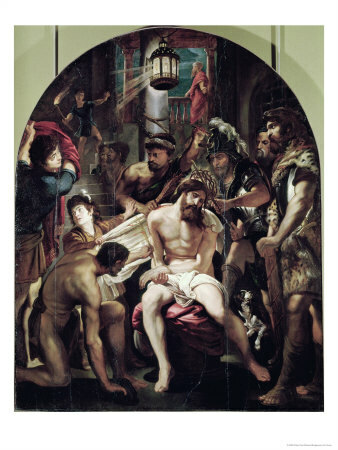 He shows Him to the crowd: "Ecce Homo—Behold the Man!" Let us contemplate our Divine Master at this moment, plunged into the abyss of suffering and ignominy, and let us realize that the Father also presents Him to us and says to us: "Behold My Son, the splendor of My glory—but bruised for the sins of My people."